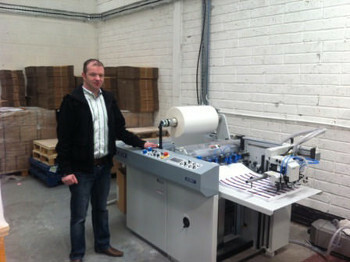 Kerry-based printing company Tralee Printing has recently installed a Delta 52 Komfi Laminator. The investment was made to reduce costs at the plant and to attract additional work to its in-house operation. One of the key selling points of the product is that it is designed to handle medium to high volume jobs which is ideal for the type of work that Tralee Printing handle. Damien-Fitzgerald-with-his-new-Komfi-Delta-52-LaminatorThe Komfi laminator was supplied through Neopost Ireland, who recently incorporated Print and Finishing Equipment, and is one of the leading, innovative mailroom and print finishing / graphics solutions providers in the country. Maguire also went on to point out that Neopost Ireland, incorporating PFE, had recently announced a new initiative which allowed companies to finance their future needs and expansion plans.